"If you become a bird and fly away from me," said his mother, "I will be a tree that you come home to." Lately I've been sitting back and just watching. Watching my boys in their ordinary day. Playing. Eating. Interacting with an assortment of people. Watching them when they don't know I'm watching. Sometimes I'll catch their eyes and smile, their faces lighting up, their lips twitching into a smile that is either openly returned or stubbornly hidden. My boys are growing before my eyes; and if I don't sit back and watch, I just might miss it. Everything. The other night I was reading The Runaway Bunny to Spencer. He made a comment that the mother bunny, who refuses to let her baby bunny run away, was mean. I corrected him and said the mom wasn't mean; she just wants her baby to know that no matter where he goes, she'll always be there. Sometimes I feel like that mother bunny--transforming myself into a fisherman to catch my fish baby, a mountain climber to reach my rock baby, a gardener to tend to my crocus baby--except my babies haven't gone anywhere just yet. But, as parents, we're constantly morphing into whatever it is our children need in any given moment, a comforter, an entertainer, an enforcer, a cook, a maid, a confidant, a teacher, a playmate. I can only assume it won't be any different once my kids have moved on to begin their own lives apart from me, where I just might become a sailboat so they cannot sail away from me. But more than likely I'll be a tree with the roots of their childhood, a place they can always come home to. End of school year picnic, another cold, gloomy, rainy day. This week looked so much different in the Mahlke household. Happier. Less turmoil. Less stress. Less whining and crying and screaming. Less timeouts and acting out. Less attention seeking. Less arguments and hitting and refereeing. In general, a whole lot less animosity and a bunch more laughter. A bunch more sweetness. A bunch more smiles. A bunch more polite please and thank yous. A bunch more easy transitions. And a bunch more playful moments between brothers. Whatever was ailing spencer the past few weeks miraculously resolved itself, leaving in its wake a helpful, thoughtful, extremely hyper, eager to please, happy little boy. And thank goodness because his moods have the ability to rattle the whole house and we were all feeling the effects of his seemingly unidentifiable ailment. Project: Beat the Rainy Day Blues. We stole a project idea from Daddy and Me and used it at home since the boys enjoyed it so much. I made a batch of homemade bubbles and added food coloring. The boys blew bubbles onto huge-mongous Cars posters; when the bubbles popped, they left behind a circle of color. 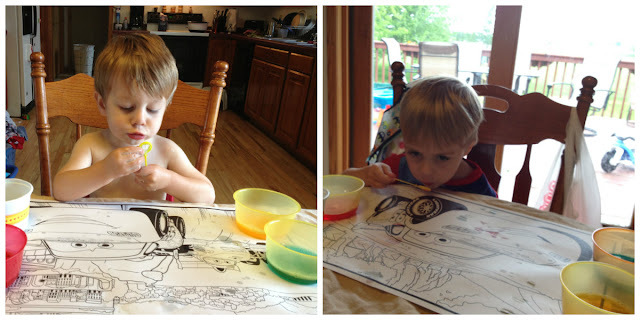 Hence, bubble painting. Try it; you'll love it. 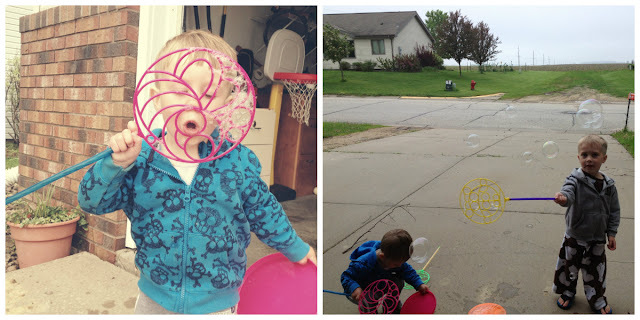 Once there was a break in the incessant rain, we bolted outside and enjoyed our newly purchased big bubble wands. Another day at Angie's Daycare. Luckily the weather cooperated and we played outside most of the morning. I whipped up a batch of sidewalk chalk paint, and away we went. These particular items were a custom order for a teeny tiny preemie. I have added the reversible bonnet onto my shop, as well. Happy shopping! I love this. They always need us, their needs just change. I sometimes feel as if I am not letting go enough in my efforts to keep them so innocent and small. Thanks for the reminder:) This is such a beautifully written post. You are so sweet, Tasha! Thank you!